Are you experiencing any of these symptoms? Insomnia, Migraines, fatigue, anxiety, or stress If So, our Aromatic Reiki Gem Stone 7 Chakra Natural Matte Agate & black aromatic Lava Stone Yoga Bracelet Can Help! Our Bracelet is your key to improve your mood and health, bring energy and balance to your life Size; 24 Stone beads, each stone diameter: 8mm(approx.). Bracelet with inner length of 20cm (7.9 inches) with the ability to expand if needed to fit almost all wrist size. 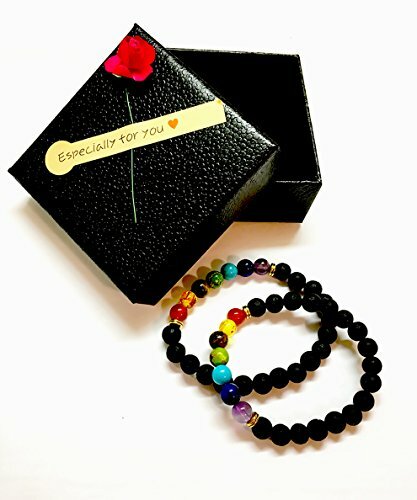 Package includes : 2 sets of bracelets in an elegant black box with a 3D red flower and a note saying, "especially for you" which makes it a perfect gift for Valentines' Day, anniversaries, and all other occasions. Risk-Free Money Back Guarantee; We care about our customers and are pride of the quality of our products & Customer service. This means 100% customer satisfaction or your money back! How to transform your Lava Stones into a portable daily Aroma diffuser and to Maximize the potential of your aromatherapy: Apply 2-4 drops of your favorite essential oil onto the lava stone, wait for about half an hour till the essential oil are completely absorbed : Apply 2-4 drops of your favorite essential oil onto the lava stone, wait for about half an hour till the essential oil are completely absorbed. LAVISH DESIGN; For her & Him meditation handmade lava Reiki Gem rock7 Chakra 8mm Natural Matte Agate and black aromatic Lava Stone Yoga; Bracelet is your key to improve your mood and health, bring energy and balance to your life. EARTHY MATERIALS. ; The 7 Chakra stones include; Synthetic Purple Amethyst Stone, Dyed Lapis Lazuli, Tiger Eye, Imperial Stone, Synthetic Blue Turquoise. SUITABLE FOR EVERYONE; Anyone can use Chakra bracelets regardless of age or gender, which makes them a very accessible medium for mental calmness and peace. UNIVERSAL DESIGN; Light weight, comfortable to wear, easy-to-use and flexible size bracelets. Bracelet includes 24 firmly arranged 8mm beads with built in durable elastic band which makes it a perfect fit for most wrist sizes. Bracelet with inner length of 20cm (7.9 inches) with the ability to expand if needed. CALMING ESSENTIAL OILS DIFFUSERS PRIME; The natural porous lava stones are a perfect diffuser for your favorite essential oils to enjoy your aromatherapy throughout the day. TWO IN ONE BRACELET; Get the benefits of the lava stones properties of diffusing oils and the power of the 7 chakra healing effects in a single product. MAINTENANCE; Bracelets should be kept clean, and away from foreign debris. EXCHANGE OR RETURN SERVICE; Great Customer Service,30 Days 100% Satisfaction Exchange and Money Back Guarantee. If you have any questions about this product by Lavish Life, contact us by completing and submitting the form below. If you are looking for a specif part number, please include it with your message. Shalimar By Guerlain For Women. Parfum 0.5 Oz.